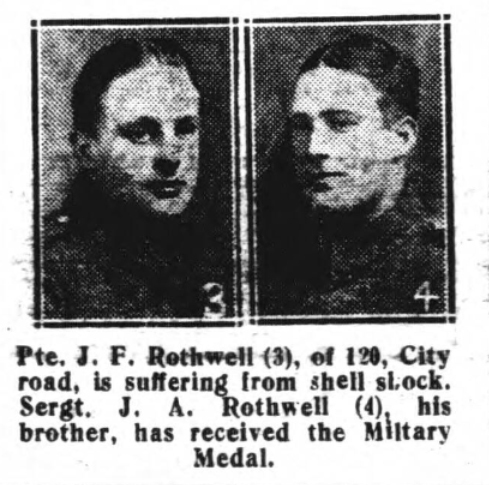 John Frederick Rothwell, born 1st Feb 1896 at Harwood Street, Sheffield enlisted with the 12th Btn, Yorks & Lancs as Private 2130 late in 1915 and probably under the “Derby Scheme”. It is believed he arrived in France as a post 1st July 16 replacement. The next thing I have is a cutting from the Sheffield Independent newspaper dated 23 September 1916 (attached) in which he is reported to be suffering from shell shock. The circumstances of this are not known but I do know that he he was sent back to “Blighty” to recover and in 1917 was with the South Notts Hussars when he qualified as a fitness instructor. At some point grandfather transferred to the Notts & Derby Regiment 1/8 Sherwood Foresters as Private 108472 and was later promoted to Corporal. From personal mementos it is known that in the final year of the war he was transferred back to the western front and was involved in the epic action throughout 1918 that broke through the Hindenburg Line, seeing action at Bellenglise and Riqueval Bridge during the crossing of the St Quentin Canal. As a postscript, 2 personal memories of my grandfather. Although he didn’t talk about the was or his experiences, I do remember him telling me about the horrific mustard gas attacks, the mud, the horses and how his life was saved by….. a german soldier!! It happened at the end of the war whilst he was guarding german prisoners of war. For some unknown reason, when his back was turned, a chinaman came at grandfather with a knife but thanks to the timely intervention of a german prisoner the attack was thankfully thwarted! Secondly, in 1976 I happened to be watching the annual BBC coverage of the Armistice commemoration from the Royal Albert Hall with my grandparents and when the “Last Post” sounded my grandfather promptly stood up, ramrod straight and took the salute in memory of his fallen comrades. For a brief moment he wasn’t my granddad….. he was a soldier again….. and until that moment I don’t think I ever really understood….